Toronto is a concrete city. International landmarks, civic buildings, cultural institutions, metropolitan infrastructure and housing from high-rise to the single-family home: much of Toronto was born of an era of exposed concrete design. Underappreciated and misunderstood, Toronto’s concrete architecture represents an exciting era of cultural investment, city building, and design innovation. Concrete Toronto reconsiders these buildings from the perspective of a diverse group of experts, including many of the original architects, local practitioners from some of Toronto’s leading design firms, city planners, university faculty and students, historians and journalists. 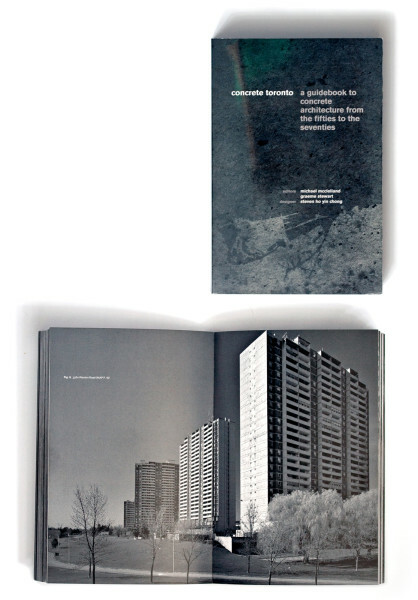 Showcasing hundreds of new and archival photos, drawings, interviews, articles and case studies, Concrete Toronto is a striking record of Toronto’s concrete architectural heritage. Concrete Toronto was featured at Boston’s Pinkcomma Gallery, and was the inspirations for the Toronto Music Gallery’s remarkable Concrete Music event. To purchase the PDF version, please click here. To purchase the ePub version, please click here.